Instruction that all nodes below a supplied node be deleted. This is similar to DeleteBranchRequest, except that the parent node (top node in the branch) is not deleted. Create a request to delete all children of the supplied node. Add to the list of children that has been read the child with the given path and identification properties. Add to the list of children that has been read the child with the given path and identification property. Add to the list of children that has been read the supplied children with the given path and identification properties. Get the list of the actual children that were deleted. 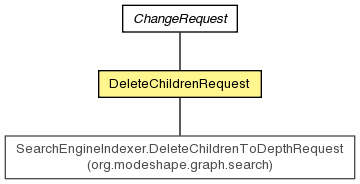 Create a request to delete all children of the supplied node. The supplied parent node will not be deleted. IllegalArgumentException - if the actual location null or does not have a path. Add to the list of children that has been read the supplied children with the given path and identification properties. The children are added in order. Add to the list of children that has been read the child with the given path and identification properties. The children should be added in order. Add to the list of children that has been read the child with the given path and identification property. The children should be added in order.